September has arrived and up at the plot the pumpkins are swelling, the blackberries are ripening and the leeks are fattening up nicely. In the kitchen, the cupboards are full; shelves groaning under the weight of all the pickles and jams. On Saturday, I planted some savoy cabbages which we hope to harvest late autumn/winter. 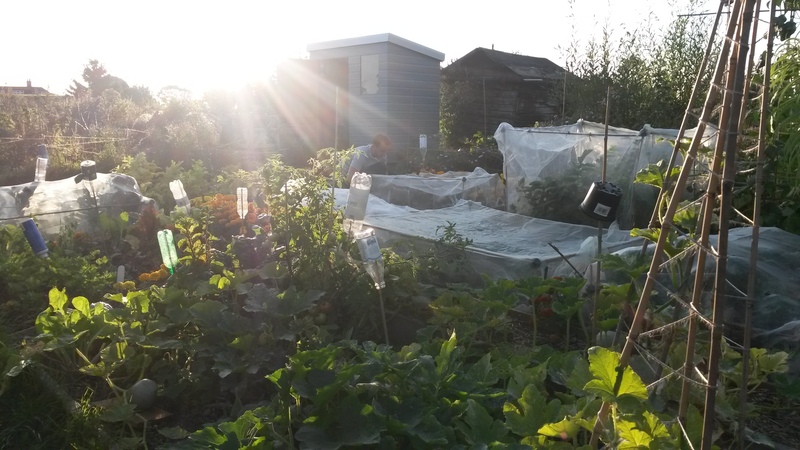 We popped up to the plot briefly this evening to check on them and Ade covered them with netting to protect them from any pests. Aside from this, there’s been very little in the way of planting, it’s still very much about the harvesting and preserving just now. You’ll be pleased to know I’m winning the war against the current tomato invasion. Pasta sauces have been frozen, handfuls have been given away and we’re currently down to one colanderful which will be deftly dispatched on Friday night when I make a delicious, home-grown dhal out of our allotment veg. A September song is one of the prettiest ever sung…well done, you!